Our Strictly Kosher basket lives up to its name, everything is Kosher and everything tastes great. We've gathered some of our favorite gourmet products including our Chocolate Roasted Nut Spread, Stoned Wheat Crackers, Feridies Peanuts, Sierra Nevada Organic Garlic and Herb Jack Cheese, Assorted Fruits, and Chewys Gourmet Rugulach. 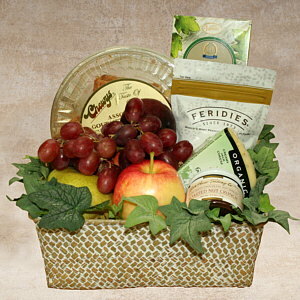 Note: If this basket is shipping we must ship 2 day air or substitute something for the fruit.